Crews prepare to battle the Dollar Ridge Fire in Utah. Photo courtesy of Utah Wildfire Info. Widespread wildfires in summertime —and, now, even springtime—are rapidly becoming the “new normal” in the American West. 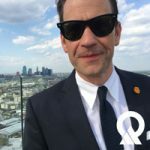 Along with the destruction and loss of forest caused by blazes, there are immediate and long-term environmental impacts that dramatically affect vital resources. 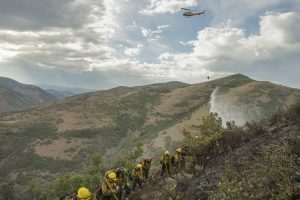 Dollar Ridge Fire, Ashley NF, UT, 2018. Photo courtesy of Utah Wildfire Info. When forests burn, large amounts of smoke are released into the atmosphere. This smoke is made up of a complex soup of gases, microscopic particles, and water vapor. The particulates that make up the smoke tend to be quite small, generally less than 2.5 micrometers in diameter, or approximately 1/70th the size of a human hair. The technical term is PM2.5, or particulate matter smaller than 2.5 micrometers. These particles are so small our bodies have a difficult time filtering them out of our airways. They lodge deep in the lungs, compromise our breathing and stress our hearts. In addition, they can also irritate our eyes and cause runny noses. People with chronic respiratory or cardiovascular issues are at the highest risk of health problems during a wildfire. Smoke pollution from fires can originate close to the fire or travel from distant blazes. Smaller local fires tend to have less energy pushing the smoke plume into the atmosphere. In these cases, the smoke hangs around the general vicinity of the burn. Massive blazes in places like Northern California and Oregon have a lot of energy. The smoke plumes from these fires are pushed high in the atmosphere and travel along the prevailing winds. Once the plume cools, it settles. The valleys of Northern Utah are popular resting spots for this smoke. Finally, the incomplete burning of forests produces carbon monoxide. Its levels are highest during the smoldering stages of a fire and can cause various risks to human health. Wildfires have wide ranging effects on water quality for years and decades after a burn. Photo courtesy of Utah Wildfire Info. Wildfires can affect the physical, chemical, and biological quality of streams, rivers, lakes and reservoirs. These changes are noticeable for years and even decades after a fire. The first and greatest impact of wildfires is a significant increase in stormwater runoff. With the loss of vegetation during a wildfire, the soil becomes hydrophobic (tending to repel or failing to mix with water). Under normal conditions, plant life slows precipitation down once it hits the landscape and lets it gradually seep into the ground. After a fire, foliage-free soil doesn’t absorb water easily. These burn scars increase runoff and provide a pathway for the transport of debris and sediment to rivers, lakes, and reservoirs. Along with the debris, elevated levels of nutrient concentrations increase in waterbodies. Nitrogen and phosphorus concentrations from burned foliage run into the water and lead to algal blooms resulting in fluctuations in oxygen or oxygen depletion in downstream waterbodies. Lastly, post-fire flash floods introduce high levels of heavy metals from ash, soils, and geologic sources into waterways. 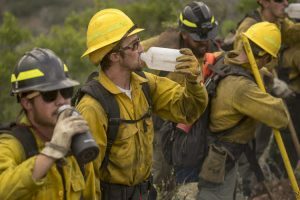 Firefighters take a break while fighting the Dollar Ridge Fire. Photo courtesy of Utah Wildfire Info. 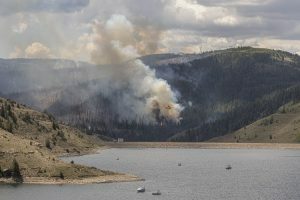 In 2017, a wildfire near the resort town of Brian Head in Southern Utah burned 75,000 acres, forced the evacuation of more than 1,500 residents, and destroyed more than 100 homes. As the blaze spread from the small ski resort, it moved into the Panguitch’s watershed. Smoke and ash contaminated a large portion of the town’s drinking-water sources at five springs in the mountains. Culinary water was quickly diverted from the five springs, and residents started drawing water from the one well in town. Engineers from the Division of Drinking Water coordinated efforts with multiple state and federal agencies to bring the springs back online. This year, a flash flood passed over the Panguitch City watershed and damaged one of the spring collection boxes. This forced city officials to issue a boil order until further repairs could be made. With about half of the water supply in the southwestern United States coming from sources in the forest, scenarios like the one in Panguitch are becoming more common. Burn areas are prone to greater rates of erosion, increasing the downstream accumulation of sediment in rivers, lakes, and reservoirs. This increases the potential impacts from past, current, and future wildfires on the quantity and quality of water in the area. Wildfires can compromise water quality both during active burning, and for months and years after the fire has been contained. In the end, the best way to mitigate the environmental impacts of wildfires is to prevent them. To lift a line from Smokey, “Only you can prevent forest fires.” Learn about fire safety at the U.S. Forest Services fire page.